MyPhotoSweeper can find and delete duplicate photos in Windows to save space and clear clutter. MyPhotoSweeper supports many popular image file formats and Raw camera images, including BMP, EXR, GIF, ICO, J2C, J2K, JP2, JPE, JPEG, JPG, PBM, PCT, PICT, PIC, PNG, PSD, PDD, TGA, TIF, TIFF, WBMP and more. 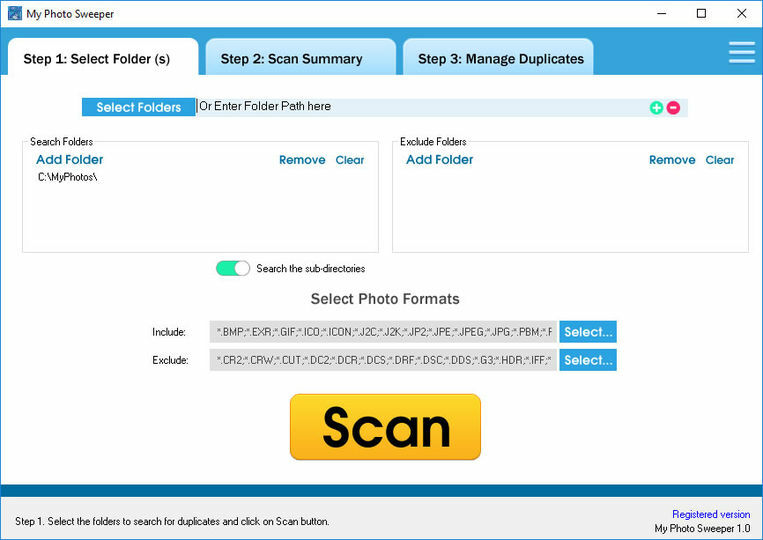 It allows you to find duplicate photos on your computer quickly and easily in a friendly step by step wizard interface. It can find all duplicate photos in a folder and its sub folders, computer or network and organize them according to duplicate groups.